Published January 12, 2011 By Anna T. This post may contain affiliate links. Regardless, I only recommend sites I've researched and/or used and trust. Words of Worth is a company that pays writers to work at home. These writers submit content for them on a variety of different subjects and in several different formats, including sales copy and web page writing. While the company is based out of the UK, they do accept people from other countries including the US, Canada, Australia, New Zealand, and Eire. So, this is your typical online content site, and while writing for content sites isn't the most lucrative route to take as a freelance writer, it can help you to earn immediate income. All assignments pay differently, but you will be informed of the rate for each one before you accept it. Unfortunately, there isn't much more info online about how much people are earning here. Related: Here's a FREE list of 200+ writing niches! When is payment made and what method of payment does Words of Worth use? Words of Worth pays their writers once every month. Their method of payment is currently bank transfer or Paypal. How does the application process for Words of Worth work? To apply, you'll have to submit a writing sample along with some basic information about yourself. You'll also be presented with several boxes to tick, each one pertaining to a different interest. This is so they will know what types of assignments you would be best at writing. Unfortunately, most writers do not hear back as to whether or not they've been hired for up to 5 months. Words of Worth says that they have a very long waiting list for writers. I realize this might be a deal breaker for some of you who are looking for income right away. If that sounds like you, I'd recommend a site like Textbroker that has a pretty quick application process and no real shortage of work available. What does writing for Words of Worth involve? Writing for Words of Worth is it bit different than other writing sites you might be familiar with. You're given contracts based on your interests and expertise. New writers can only work on one contract at a time. The contracts you receive will be for a specific number of assignments to be completed within 30 days. Some contracts might include 10 articles per month, while others could include up to 80. You don't get to pick what you write — everything is sent to you, and you are expected to finish it within the time frame allotted. Words of Worth does try to accommodate you, however, and they try to match contracts up to you based on what you're knowledgeable in so that the writing won't be incredibly challenging, and you can get comfortable with the subject matter faster, hopefully building up speed over time. If for some reason the client cancels the contract you're working on, Words of Worth will either give you a new contract to work on based on your interests, or they place you back on the waiting list until something else opens up that would be a good fit for you. What Are Words of Worth Ratings From Writers? As of December 2018, Glassdoor has them at 4 stars. However, this is based on only one review so take that with a grain of salt. After scouring around the internet for other information, I've discovered that overall people seem satisfied, and there are no reported issues of anyone not being paid on time. Can Words of Worth Replace Your Day Job? We never recommend that you count on an opportunity like this to replace your day job (if you have one). Because Words of Worth is more of an independent contractor type opportunity, be sure to have other work available if possible. With these content sites, you can't always expect you will have work to do which makes it pretty scary to depend on it for all your income. Be sure to branch out a bit and apply at some other online writing sites so you'll have access to other places if work runs out at Words of Worth. You can go here to apply to write for Words of Worth. We wish you lots of good luck if you go for it! Want to Go Into Business For Yourself as a Writer? Here's a Free List! This is the most profitable route to take as a freelance writer. You can get your own clients and set your own rates, which you cannot really do with a site like Words of Worth. A six-figure income is not outside the realm of possibility when you're running your own business. Not sure what you'd write about? I recommend grabbing a copy of Gina Horkey's FREE list of 200+ writing niches to consider! 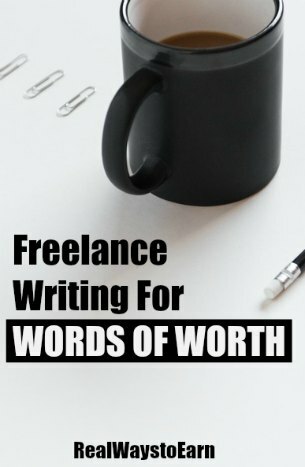 She's also written an incredibly detailed guide on working for yourself as a freelance writer if you're interested in getting a lot more information on how to go about it. Hi! Anna! I have been doing work for WOW for about a year and a half. Just wanted to add that they do pay by PayPal (though the fee is taken from your account…it’s not a large fee). They may also pay by direct deposit, but I have mine set up as PayPal. I just wanted to let you know because I know for some, the method of pay can be a deal breaker. I am often leery of anyplace that wants my bank account info, even if it is to pay me! Thank you April! I will update my info.